EXETER – The No. 2-seeded Exeter Monarchs and No. 8-seeded Central Valley Christian Cavaliers had split their Central Sequoia League games this regular season. 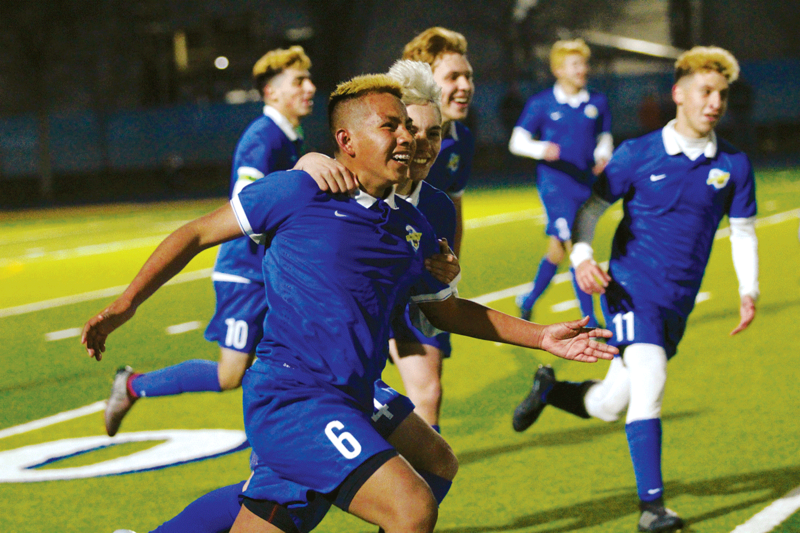 As a result, last Friday’s Division VI Valley Championship game acted like a rubber match to break the tie, and it was the Monarchs defending their home turf, like they had done in the regular season, by defeating the Cavaliers 2-0 (2OT). It seemed only fitting that the final meeting between the Monarchs (12-7-3, 5-4-1), and Cavaliers (9-9-2, 6-4) would need over time considering their two CSL matches were so closely contested. In the first 10-minute overtime period Exeter continued their game plan of pressuring the sides of the CVC defense, and then cutting inside. A yellow card in the fifth minute to CVC’s middle defender Nico Puckett, who measures 6 feet, 3 inches, opened up some space inside the box. Two minutes later Lara took advantage of that opening by cutting in from the near side. Still contending with a CVC defender, he got a good enough shot which slid past the Cavaliers’ goal keeper and into the lower left corner of the net. “I just took the shot hoping it would go in,” Lara said. In the second overtime Exeter got an insurance goal. Heri Ortega scored off a rebound opportunity which put Exeter ahead 2-0, and took wind out of CVC’s sails. The amount of attacks on both ends of the field earlier in the game gave the impression of a high scoring affair. The biggest opportunity, almost a given, was a penalty kick taken by Exeter during stoppage time in the first half. Aldo Hernandez took the shot after Lara had been fouled in the penalty box. Hernandez kicked the ball to his right, but was knocked away by CVC’s keeper. Only minutes before that the Monarchs had two opportunities to put away a rebound. The second chance rung off the right post, and then was snagged and cleared. In order to make their first finals appearance since losing the title in 2015, Exeter had to take care of some unfinished business. Exeter defeated the defending champions No. 6-seeded Orange Cove Titans (10-13-7, 3-6-3) in the semifinals 3-0. Last season, the Titans went on the road every round and won the title by defeating the Strathmore Spartans in penalty kicks. According to Lara, Exeter’s hope is to add a Southern Regional Championship to the trophy case. 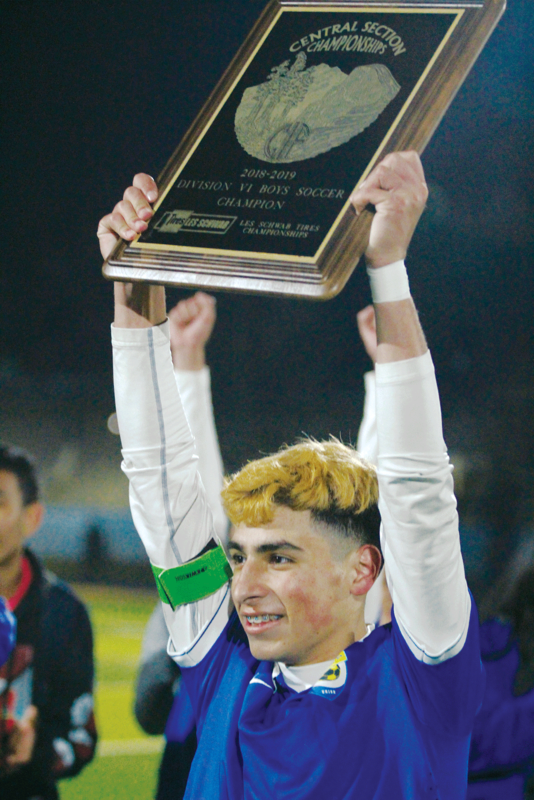 But the task at hand will be a long road after Exeter earned the eighth seed in Division V, and took on the top-seeded Garces Memorial Rams (23-2-4, 7-2-1) last night. Results were reached after press time.